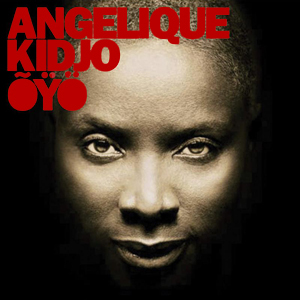 Angelique Kidjo digs into her roots with her new release, ‘OYO’ - roots that reach far beyond her West African homeland of Benin because Grammy Award-winning singer, dancer and songwriter Kidjo is a definitive 21st century world artist. Her art roves across boundaries, genres and ethnicities, finding the connections that link musical forms from every part of the world, while still bonding closely with her own traditions. The songs on ‘OYO’ embrace rhythm & blues, soul music, jazz, and Beninese melodies, as well as a trio of her own original works. Growing up in the port city of Cotonou, raised by parents who honoured many forms of creativity, she was exposed to a far-ranging array of music and dance. West Africa, in the ‘60s, had an omnivorous appetite for international pop music and Kidjo was intensely familiar with the music of James Brown, Otis Redding and Carlos Santana as well as Miriam Makeba and Bella Bellow before she reached her teens. Curtis Mayfield’s ‘Move On Up,’ which she sings in a duet with multiple Grammy Award-winning singer John Legend, epitomizes her affection for that music. Chosen, says Kidjo, “by my daughter,” the song illustrates her skill at finding both the timelessness and the contemporary qualities in a song. In 1970, Mayfield sang ‘Move On Up’ as a rallying call to under-privileged American youth. In 2010, Kidjo and Legend, backed by a spirited chorus and riffing horns, sing ‘Move On Up’ as a call to African youth to direct the fate of their continent. That music – the music from her youth – is the theme of the album’s mesmerizing tracks. In the case of her renderings of four songs from iconic American pop music figures, each is a display of Kidjo’s ability to, as she says, “bring the music of Benin” into her interpretations. Carlos Santana’s, ‘Samba Pa Ti,’ emerges as a captivating ballad spotlighting the always-bewitching trumpet of Roy Hargrove. On ‘Cold Sweat,’ featuring members of the Afro Beat band, Antibalas, the horn-heavy riffs and call-and-response back-up singing frame a driving vocal from Kidjo that would surely have been a turn-on for James Brown. She remembers hearing Otis Redding’s ‘I Got Dreams To Remember’ when she was young, and her brother telling her to “shut up” when she sang it, saying “You don’t know the words.” But Kidjo prevailed and sings it with a quality of soul that is utterly transcendent. Another old familiar tune, Aretha Franklin’s ‘Baby I Love You,’ begins with percussion and voices before Kidjo and Dianne Reeves dig into a stirring series of Franklin-inspired diva exchanges. In the years after Kidjo’s initial exposure to the American pop music that influenced her as a child, her career escalated in a steadily rising arc. Heard on national radio as a teenager, she moved to Paris in the early ‘80s, when the political situation in Benin became untenable for an independent creative artist. Initially active in the jazz community, she gradually expanded her interests and by the ‘90s had become a major international artist. Kidjo’s original songs illuminate the emotional range of her creativity. She describes the spirited ‘Kelele’ as a “High Life from Ghana,” and goes on to add that “Everywhere I go in the world I want people to remember that they are human beings and to remember that if we don’t have fun, everything we do will have no taste.” Traces of Brazil course through the lyrical, floating rhythms of ‘Afia,’ written with guitarist/singer, Vinicius Cantuaria. Two other items further illustrate her open-minded receptivity to different forms of music. ‘Petite Fleur’ is a classic jazz piece written by soprano saxophonist, Sidney Bechet and a favorite song of Kidjo’s father, who died in the spring of 2008. “I had to include something to remember him,” says Kidjo. “He produced my first concert, and he stood up against those people who said ‘You should never let your child become an entertainer.’” She invests the French lyrics with the intimate warmth of loving memory.